As the details of the peace accord between the Central Government and NSCN (Isak-Muivah) remain ambiguous, parliamentarians from Manipur and Arunachal Pradesh have locked horns with their counterparts from Nagaland over the possibility of altering their respective state boundaries. 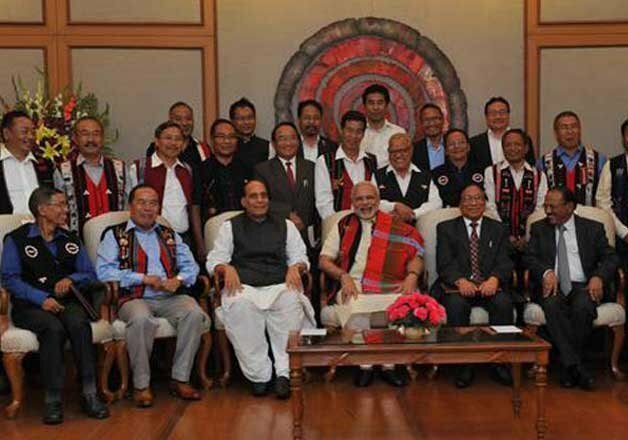 Despite reports that the provision of redrawing the state's border to incorporate Naga-inhabited areas in 'Greater Nagaland' had been dropped, the Members of Parliament said that the demand for Greater Nagaland had been the "most important demand" of the NSCN and reaching a conclusion without it would be "simply impossible". "We welcome the peace accord because it is a move to tranquilise decades long violence in Nagaland. But if the peace in Nagaland is at the cost of our territories than we won't let it happen," Ninon Ering, Member of Parliament from East Arunachal Pradesh, told IANS. He said It should be understood that Nagas staying in any other state apart from Nagaland "are an integral part of that state as they have been staying there for years. Where does the demand for other states to give up its Naga-inhabited areas come from?" he asked. Noting that there were only four Naga tribes living in Arunachal Pradesh, including the Wancho, Tangsa and Nocte, Ering said: "At most the government can allow them to have autonomous councils, but giving up those areas to Nagaland won't be possible." IANS spoke to a number of MPs from the region. On Monday, the NSCN-IM and the government had signed the Naga Peace Accord, settling an almost 20-year-old peace negotiation process that started in 1997 after the group signed a ceasefire agreement. NSCN-IM general secretary Thuingaleng Muivah, who signed the accord oat a ceremony at the prime minister's 7 Race Course Road residence on Monday, had hailed it as a "momentous occasion". Thokchom Meinya, Member of Parliament from Inner Manipur constituency, said that the BJP-led government and the NSCN-IM were in "a hurry to settle their problems without realising the harm caused" to other north-eastern states. "The way government is trying to keep the content of the accord confidential clearly shows that it might have something which is not in favour of Nagaland's neighbouring states," Meinya said. He added that the government should have at least informed Parliament before signing the accord with the NSCN-IM. "Discussing in Parliament with all stake-holders was necessary," he added. Nagaland shares its boundary with Assam, Manipur and Arunachal Pradesh. At least three districts in Manipur - Ukhrul, Tamenglong and Senapati as well as two in Arunachal Pradesh - Tirap and Changlang - are Naga-inhabited districts. P.A. Sangma, Member of Parliament from Meghalaya's Tura constituency, said: "End to the conflict in the North-Eastern region is a must. But the government should be well aware that they can't keep Nagaland happy by making its neighbouring states sad." However, Nagaland's lone Rajya Sabha member Khekiho Zhimomi termed the objection raised by the other MPs from the region "groundless" and said that "all the Naga inhabited areas in the North-Eastern region belonged to the Naga ancestors" and should be made a part of the Nagaland. "It is a positive development for Nagaland. The peace accord should be completely in the interest of the Nagas regardless of whichever North-Eastern states they might be living in," Zhimomi said. "Why should they object to the Naga inhabited land being given to form Greater Nagaland? We are only demanding our ancestoral lands in the neighbouring states where the Naga tribes have been staying for centuries," said Zhimomi. On Tuesday, former Nagaland chief minister Neiphiu Rio had told IANS: "The demand for Greater Nagaland is the main demand of the NSCN - irrespective of which faction it is. The question of dropping that demand does not arise as this is what the conflict is all about."